In Poetry Wales (Volume 53 Number 3, Spring 2018) Chris McCabe reviews The New Concrete Poetry : Visual Poetry in the 21st Century – and includes his account of my text piece – Book Pages Destroyed by Typewriter – included in this collection. 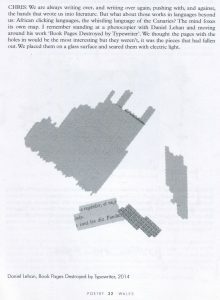 I remember standing at a photocopier with Daniel Lehan and moving around his work ‘Book Pages Destroyed by Typewriter’. We thought the pages with the holes in would be the most interesting but they weren’t, it was the pieces that had fallen out. We placed them on a glass surface and seared them with electric light. The Book Pages were taken from a variety of vintage books published in French, and were made whilst living in Quebec, their frail pages destroyed by typing heavily and with no ribbon in the typewriter. This new volume is a highly illustrated overview of contemporary artists and poets working at the intersection of visual art and literature, producing some of the most engaging and challenging work in either medium. Edited by poets Victoria and Chris McCabe, with an introductory essay by renowned poet Kenneth Goldsmith, The New Concrete is an indispensable introduction to the breadth of concrete poetry being produced today. This extensive survey features over 90 artists including: Vito Acconci, Tauba Auerbach, Fiona Banner, Derek Beaulieu, Caroline Bergvall, Jaap Blonk, Pavel Büchler, Henri Chopin, Bob Cobbing, Simon Cutts, Alec Finlay, Ian Hamilton Finlay, Karl Holmqvist, Jenny Holzer, Lilianne Lijn, Hansjörg Mayer, Stuart Mills, Tom Phillips, Colin Sackett, Nick Thurston, Sue Tompkins, and Cerith Wyn Evans. 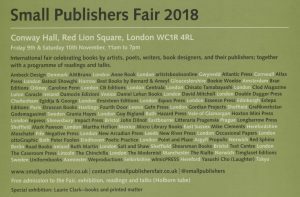 The Small Publisher Fair takes place at Conway Hall , Red Lion Square, London WC1 on Friday 9 and Saturday 10 from 11am to 7pm. Available at my table will be the books shown in the shop section of this website and a host of new books including those in previous posts below.